Optionally configure a proxy for package downloads for targets with limited internet connectivity. Click Repositories > Add Repository. The Add Repository dialog appears. Required: Enter a Name for the repository credential. Optional: Enter a Comment that describes the repository credential. Select Access DataStax Repo if using the DataStax Repository for packages (default). Enter the Repository Key URL to retrieve a public key from. A repository key URL is the address of the public key of a package repository. You can download the key and use it to verify that packages downloaded from the repository have not been tampered with. For the DataStax Repository, using the configured proxy is enabled by default. If you are not using the DataStax Repo, the Use Configured HTTP Proxy option is disabled. Custom package repositories are commonly located internal to the HTTP proxy. If your custom package repository is external to your proxy, select Use Configured HTTP Proxy to ensure the package manager on your target nodes uses your configured HTTP proxy. For information on configuring Lifecycle Manager to forward requests to your proxy, see configuring a proxy for package downloads. Required: Enter the Username and Password for accessing the DataStax Repository. The username and password must be specified if authentication is enabled on the repository. 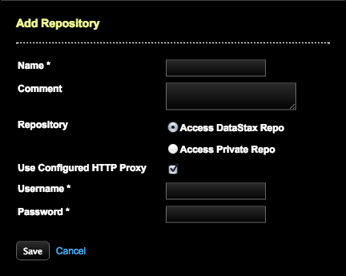 The DataStax Repository always has authentication enabled. For the DataStax Repository, the username and password are the DataStax Academy account credentials you created on the registration page. The repository username and password are used when downloading packages (they are not used when fetching the repository public key). Note: When configuring credentials in a Repository, special characters such as #, $, and so forth are supported, but non-ascii unicode characters are not. If you have further questions, please contact DataStax Support and reference ticket OPSC-8921. The newly defined repository credential is listed on the Repositories page along with edit and delete options. Edit the cluster in the Clusters workspace to select the repository. The datacenters and nodes inherit the cluster repository.